Thank you for joining me as we count down to the next MFT release. We are four days away from the big day! All the new Stamps, Die-namics, and Stencils will be available on Tuesday, April 5 at 10:00 pm EST. Be sure to check out the MFT Blog to see all the new items being revealed today. Don't forget to leave a comment on the MFT Blog countdown posts, YOU could win one of the five $75.00 gift vouchers. We have a couple of adorable new Birdie Brown sets for you this month, Cool Cat and Lucky Dog. These sets are sure to be a hit with all of our animal lovers. My card today features a few pups from from Lucky Dog stamp set. The images were stamped on X-Press It card stock, coloured with Copics, and then die-cut with the Lucky Dog Die-namics. I stamped the background with the Paw Print Background in Grout Gray Premium Dye Ink. The sentiment is one of the many fabulous sentiments in the Lucky Dog stamp set. Your card is fantastic! The pets are adorable! Great use of the window! They sell the message! I came over from the blog for a closer look at these adorable pups! Fun design, Julie. Such a darling card! The window effect is just perfect for the message. Love your details. What a great stamp set to use with that blueprint. What a cute card. I love all those doggies! Great card. Those dogs are so doggone cute! 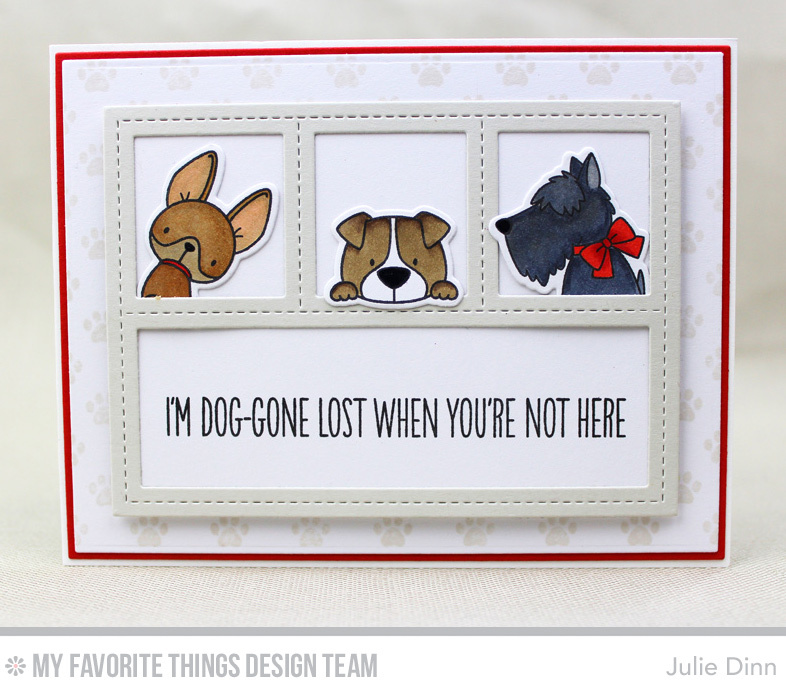 I love the new Lucky Dog stamps and dies! And I know I'm getting quality products from MFT. I feel lucky for such a creative design team!